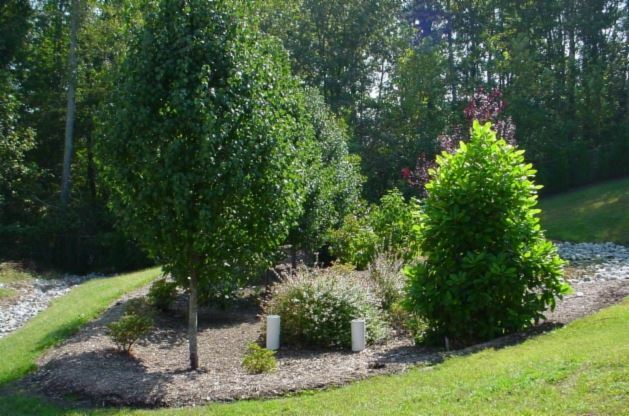 Bioretention Cells are planted depressions that are designed to absorb rainwater runoff from water impervious areas like roofs, driveways, and walkways. This reduces rain runoff by allowing stormwater to soak into the ground (as opposed to flowing into storm drains and surface waters which causes erosion, water pollution, and flooding). Dry Detention Ponds are basins whose outlets are designed to capture the first half inch of rain and are effective in removing stormwater pollutants. Unlike wet ponds, dry ponds do not have a permanent pool; however, dry ponds may still be used to provide flood control. Wet Detention Ponds are basins that have a permanent pool of water throughout the year. The wet pond is designed to capture the first one inch of rain and release it over a period of two to five days. Wet ponds treat and filter stormwater runoff through settling and through nutrient uptake by plants and other aquatic organisms. Infiltration Trenches are long, narrow, excavated trenches backfilled with stone and lined with a filter fabric. Stormwater is stored in the void space between the stones and percolates through the filter fabric into the groundwater. Infiltration trenches perform well for removal of fine sediment and associated pollutants. However, these devices are only useful to treat small areas.